Years before Europe went to war, Japan’s imperial ambitions targeted the divided Chinese Republic. Crippled by political paralysis and centuries of fitful the battlefield, use Volunteer Air Corps, acclimatizing troops, and other changes.development, China is still not a pushover. With vast reserves of manpower and resources, not to mention a giant landmass, the Republic of China and its temporary ally, the Communists under Mao, can withstand another aggressor. There have been, after all, very many. National Focus Trees for China: Guide the Chinese Republic or Communist China through the war, guided by your own vision of the future. Modified Focus Trees for Germany and Japan: Two major Axis powers now have alternate history paths, including the chance to depose Hitler or restore democracy to Japan. Chain of Command and General Traits: Put multiple armies under the direction of a field marshall to coordinate large movements of army groups, using the traits of your generals to take advantage of their unique skills. Decisions: Spend your political power on national decisions and missions to strengthen the war effort. 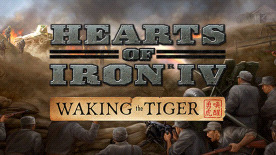 Please note: This content requires the base game Hearts of Iron IV in order to play.